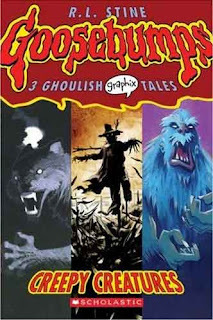 Werewolves, scarecrows and abominable snowmen romp the pages of this graphic adaptation based on three of R.L. Stine’s popular horror series of the same name. Stories include: The Werewolf of Fever Swamp, The Scarecrow Walks at Midnight, and The Abominable Snowman of Pasadena. Told in black and white, each story is rendered by a different artist, appealing to a wide range of tastes. The stories are typical for the Goosebumps series, with plenty of age-appropriate spook and creep to satisfy the young soul searching for fun horror. Talk to any librarian and she will tell you that the horror books fly off the shelves. The GOOSEBUMPS graphic novels are no exception as kids will flock to them – the spookier the better. Monsters and frightful tales are at the soul of our literary culture and many kids get into it. GOOSEBUMPS is excellent for kids as the stories are goldilocks; that is to say that they are just the right amount of scare. This series of books is about monsters and whatnot. Nothing bloody or gory, just good old-fashioned horror. Horror is well liked and hotly sought after by children. They are drawn to the scary, so this book has a built-in audience, even among those who do not like to read. For the teachers who promote a lot of writing experiences, kids will love to come up with their own horror stories, without a lot of prodding and poking. Other books in the series include: TERROR TRIPS, and SCARY SUMMER. Click here to see a sample from each book. The GOOSEBUMPS series, be it novel or graphic novel, are solid horror stories for kids. They will read the stories, and the books may, indeed, draw some students who are not interested in other types of stories.